On this date in our family history . . . the 18th day of June . 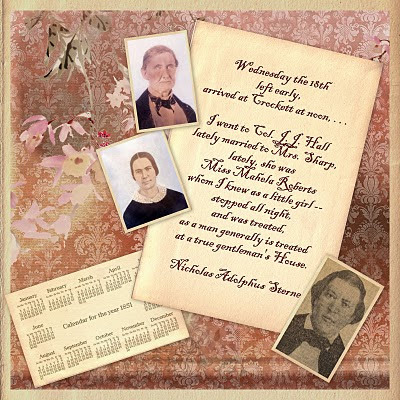 . . in the year 1851 . . . Nicholas Adolphus Sterne (1801-1852) spends the night in the J.J. Hall household in Houston County, Texas . . . The Mrs. Hall, aka Mahala Sharp Hall nee Roberts (1838-1885), is a 3rd great-grandma to the Keeper of this family history blog . . . and she was married to Joshua James Hall (ca. 1790 - ca. 1871) on the 12th day of February in 1851 in San Augustine County, Texas . . . Sterne wrote about this 18th day of June as follows . . .
Wednesday the 18th [of June 1851] left early, arrived at Crockett at noon, dined at my opponent's-- Col Long's, left after dinner in company with Judge Randolph a Candidate for the lower House for this, Trinity and Anderson Counties, went to Cook's mills where we parted, I went to Col J.J. Hall lately married to Mrs Sharp, lately, she was Miss Mahela Roberts whom I knew as a little girl-- stopped all night, and was treated, as a man generally is, treated at a true gentleman's House. I just love your "on this date" posts and the journal entries. Thanks for sharing. . . I just love your history and the beautiful way you frame it. Envious, I am.